Bluetooth speaker, wired and wireless TV speaker, TV soundbar. 20W 3D stereo surround sound, deep bass. Crystal clear and fine-sounding audio supported by 4 X 5W drivers. Build-in Subwoofer, Digital Signal Processing (DSP) system with high-fidelity sound system. Amazing sound with 3D surround sound High-Fidelity sound system, best for home, partying, camping! Bluetooth 4.2, support HSP, HF, A2DP,AVRCP format notification Sound. Bluetooth name: BS-28B. uWorld TV soundbar has a new design with beautiful shining surface and one surface of hollow-out design. 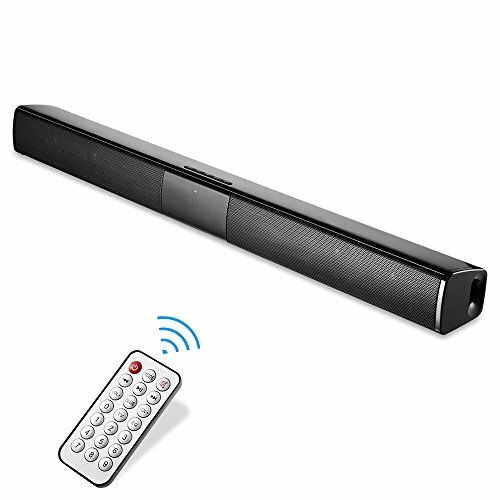 Our Bluetooth sound bar is outstanding and eye-catching in appearance. Bluetooth TV speaker output power of 20W; 4 speakers of 360° stereo hi-fidelity sound, deep bass. Perfect for music, movie for party, meeting, camping, indoor and outdoor activities! If you have any questions about this product by TRYeve, contact us by completing and submitting the form below. If you are looking for a specif part number, please include it with your message.